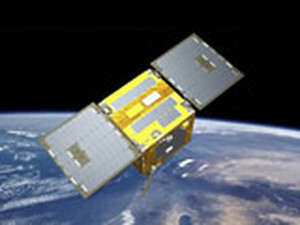 As part of Japan’s Small Demonstration Satellite Program, Small Demonstration Satellite-4 will be launched on this flight. This 50-kilogram satellite will be used to verify new technologies for components and devices in space prior to providing highly established technology to practical satellites and scientific probes. The spacecraft features three-axis-stabilization and two solar arrays that generate 120 Watts of electrical power. The Cubesat will be performing four technology validation checkouts. The FHP On-Orbit Experiment will assess the special features of the flat heat pipe thermal control system component to provide means of comparison with ground testing and theoretical models. IST – or In-flight experiment of Space Materials using THERME – is planned to characterize the degradation of thermal control materials. For that, temperature measurements will be made by the experiment hardware. THERME was provided by CNES, France. The Quartz Crystal Microbalance study will assess a quartz microbalance developed by the scientific division of JAXA (ISAS). This study will contribute to the development of future sensors that will measure internal contamination. SPAISE, the Space-based Automatic Identification System Experiment will receive Signals from ships with two antennas. This study will provide information on the ASI (Automatic Identification System) receiver system. SDS-4 will operate from a 677-Kilometer Sun-Synchronous Orbit.